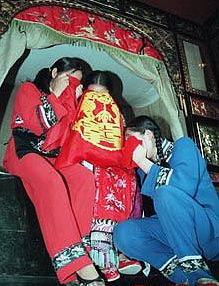 The custom of crying marriage existed a long time ago in many areas of Southwest China's Sichuan Province, and remained in vogue until the end of the Qing Dynasty (1644-1911). Though not so popular as before, the custom is still observed by people in many places, especially Tujia people, who view it as a necessary marriage procedure. It is very much the same in different places of the province. According to elderly people, every bride had to cry at the wedding . Otherwise, the bride's neighbors would look down upon her as a poorly cultivated girl and she would become the laughingstock of the village. In fact, there were cases in which the bride was beaten by her mother for not crying at the wedding ceremony. During the Warring States Period (475-221BC), as historical records reveal, the princess of the Zhao State was married to the Yan State to be a queen. Her mother, on the point of her daughter's departure, cried at her feet and asked her to return home as soon as possible. Later, the story was alluded to as the origin of the "crying marriage" custom. In west Sichuan Province, the custom is called "Zuo Tang (Sitting in the Hall)". Usually, the bride begins to cry a month before the wedding day. As the night falls, the bride walks inside the hall and weeps for about an hour. Ten days later, her mother joins her, crying together with her. ; Another ten days later, the grandmother joins the daughter and mother, to cry together with them. The sisters and aunts of the bride, if she has any, also have to join the crying. The bride may cry in different ways with diversified words, which was also called "Crying Marriage Song"; the somewhat exaggerated singing helps to enhance the wedding atmosphere. In a word, crying at wedding is a way by custom to set off the happiness of the wedding via falsely sorrowful words. However, in the arranged marriages of the old days of China, there were indeed quite a lot of brides who cried over their unsatisfactory marriage and even their miserable life. In fact, swearing at the matchmaker used to be an important part of crying marriage, as well as the most rebellious part. In the old society, women were bound by the so-called "three obediences and four virtues", thus having no say in their marriage, which was all arranged by the matchmaker and the parents. Therefore, the brides often swore at the matchmaker before stepping inside the sedan, which was also seen as a pent-up of their dissatisfaction with and hatred of the old matrimonial system. This is also reflected in local operas and other folk art forms. Once, there was a scene called "Yingtai Swearing at the Matchmaker" in a Sichuan Opera on the butterfly lovers. In the opera, Zhu Yingtai severely scolded the matchmaker with sharp crying words, which fully show her strong character and her hatred of the feudal system. The scene has been removed, as the custom of swearing at the matchmaker no longer exists in many places, especially in cities. In the countryside, where the matchmakers still play an important part in marriage, brides continue to swear at them in crying marriage. However, it is said that the matchmakers never fear being scolded, but not being scolded, which means they will never get rid of the bad luck (the Chinese character for matchmaker is a homonym of that for bad luck).